As a China crawler bulldozer manufacturer and supplier, we offer Crawler Bulldozer and other heavy equipments as road roller, motor grader, and wheel loader, backhoe loader. Crawler bulldoze is as crawler tractor equipped dozer blade in the front to push moving something on construction site, we have experience more than 50 years of manufacturing bulldozers, so long time of handling construction machinery and equipments we know how to make high quality with low price crawler bulldozer and other construction equipments. 1.1.1 This crawler bulldozer is equipped with plateau-purpose 6135AZK-20 Shangchai diesel engine ,the engine is characterized by high power reserve, high output torque, low fuel consumption. 1.1.2 It uses wet type multi-disk, non constant-engaged main clutch which is stable in operation and durable. 1.1.3 The construction equipment uses dry type, multi-disk steering clutch. The steering clutch is hydraulically-assisted operated and easy to maintain. 1.2.1 The engine of this crawler bulldozer is characterized by high power reserve, high torque rate and low fuel consumption. 1.2.3 Joy-stick control JOY-STICK control for working implements ensures high reliability and easy operation. 1.2.4 The working implements are fitted with electric-locking system. 1.2.5 ROPS-FOPS driving cab, air-conditioner, warm heater, Diethyl ether starter, angle blade, straight-tilt blade and U-shaped blade are also available for you to choose from. 1.2.6 The maximum digging depth is 440 mm. The maximum lifting height of blade is 1180mm. The gradeability of this earthmover is 30°. 1.3.1 Our PD185Y pushdozer is equipped with Shangchai C6121ZG07a engine which can offer strong power. The engine is designed with exhaust gas turbo charger and features low fuel consumption, reliable performance and long service life. 1.3.2 PD185Y crawler bulldozer is fitted with interior valve load sensor system which enables the output power to distribute rationally according to the change of load, thus achieving energy-saving effect. 1.3.3 The forward and backward, left and right steering as well as the speed change of this dozer is controlled by a single lever, so easy and flexible operation is achieved. 1.3. 4 The steering brake system uses wet, friction disc brake, ensuring high braking stability and reliability. 1.3.5 The maximum digging depth is 450 mm. The maximum lifting height of blade is 1200 mm. The gradeability of this earthmover is30°. 2.1.1 The engine of these pushdozers is characterized by high coefficient of power reserve, high torque rate, low fuel consumption, reliable performance. 2.2.3 Hexahedral driving cab gives a wide visual field. 2.2.4 Furthermore, there are many other devices available, such as ROPS-FOPS cabin, normal driving cab, air-conditioned driving cab, warm heater, Diethyl ether starter, angle blade, straight-tilt blade, U-shaped blade, and so on. 2.2.1 Joy-stick control for working implements ensures high reliability and easy operation. 2.2.2 Hydraulic system uses constant-delivery pump to control the load feed back, ensuring less heat loss and multifunction of working implements. 2.2.3 Electronic monitoring device is able to monitor the alternator charging voltage, fuel level, water level, oil pressure, cooling water temperature, torque converter oil temperature, hydraulic oil temperature, air filter blockage alarm and running time and other running parameters. 2.2.4 PD410Y-1 crawler bulldozer is designed with new elastic shock-adsorbing undercarriage. The vibration transferred from the ground to the dozer is reduced by 50%. The working efficiency is increased by 30%. The service life of the sticky and elastic mechanism is more than 4000h. 2.2.5 The maximum digging depth is 749mm. The maximum lifting height of blade is 1620mm. 3.1.1 Our T80 crawler bulldozer is fitted with YTO LR4A3Z-22 boosting engine. The engine can offer strong power and is characterized by low running noise and low fuel consumption. 3.1.2 With 4F+2R fixed-shaft mechanical gear shifting gearbox, the construction equipment adapts to various working environments. 3.1.3 Its traveling mechanism has rigid chassis and semi-rigid hanger. 3.1.4 Advanced operation control system, fully hydraulic boosting steering. 3.1.5 This earthmover is suitable for bulldozing operations in narrow areas. 3.1.6 It is equipped with standard heating and ventilation devices. Air conditioner is optional. 3.1.7 It is of high reliability and high working efficiency. 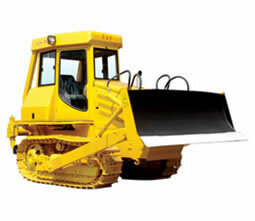 3.1.8 The pushdozer shovel size is 2480W×922H mm. The maximum lifting height is 736.5mm.The maximum in-soil depth of dozer shovel is 370mm. 3.2.1 The diesel engine of our T100G and T120N dozers is manufactured by use of Ricardo technology and it features low fuel consumption and high torque reserve. 3.2.2 Our crawler bulldozer uses dry, multi-disk main clutch. The master clutch features big torque reserve and high reliability. 3.2.4 The steering clutch is dry, multi-disk turning clutch. It is manually operated, with hydraulically-assisted. 3.2.5 Our pushdozer can be applied in coal-reserve site, desert and some other special working requirements. 3.2.6 The hexahedral driving cab is fully closed, effectively protecting the driver from the external noise. 3.2.7 The performance status of electric system is indicated in the electronic monitor. 3.2.8 The earthmover is equipped with standard heating and ventilation devices. Air conditional is optional. 3.2.9 Direct pouring shovel, environmentally friendly shovel, angle shovel and coal-pushed shovel are also available for you to choose from. 3.2.10 The maximum lifting height of T100G dozer and T120N dozer is 830mm and 955mm separately. The maximum in-soil depth of T100G dozer shovel and T120N dozer shovel is 370mm and 380mm separately. In order to better meet consumer needs, we also offer combine harvester, crawler excavator, paver, mining dump truck, and so on. Our products have obtained CE, E-mark and CCC certifications. They are well received in many countries in Asia, Europe, America, Australia and Africa.